Mmm, such a tasty summer entree. This recipe has survived dinner parties from Chicago to Buenos Aires, and every time I make it, it’s a bit different based on what’s in-season and what ingredients I have access to. In Buenos Aires, the wide variety of ethnic food products we’re accustomed to in the United States was immensely narrowed down, but with a little creativity (and a heavy hand with the not-spicy spices) I made it work. The flavors and textures in this dish are unexpected and fresh. 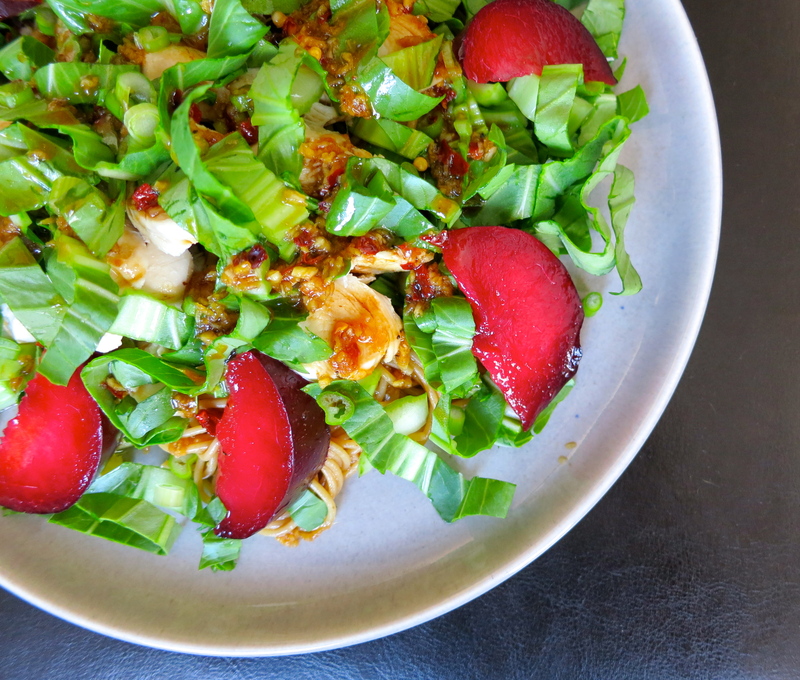 It’s a combination of juicy stone fruit, slightly bitter bok choy and slurp-worthy noodles tossed in a peppery-sweet sauce with a spicy kick. If spicy’s not your thing, omit the cayenne pepper and go easy on the crushed red pepper. I tend to use whole grain angel hair or soba noodles, but ramen or rice noodles would work well, too. And I grab whatever stone fruit looks most appealing. Nectarines work really well, but these plums were too pretty to pass up. This is another oldie but a goodie adapted from Better Homes & Gardens. Cook the tenderloins in a small amount of boiling water in a large skillet, covered, for 12 to 15 minutes or until no longer pink. Drain and cool slightly, then slice against the grain. Cook noodles according to package directions. While the pasta’s cooking, whisk together the chicken stock, soy sauce, hoison sauce, sugar, olive oil, sesame oil, ginger, crushed red pepper, cayenne pepper and black pepper in a small bowl. Drain the cooked pasta, rinse in cool water and toss it with about 3/4 of the dressing. 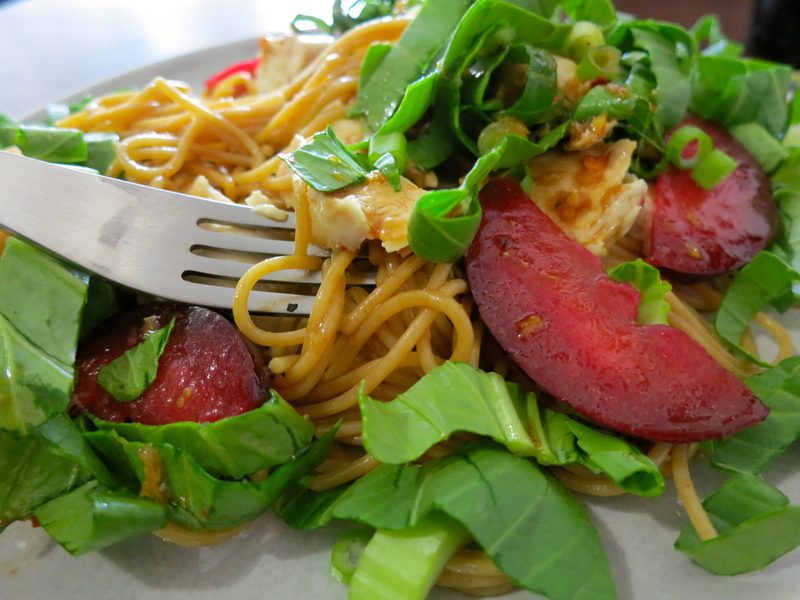 Divide the pasta up on your serving plates, and top with chicken, fruit, bok choy and green onions. Drizzle with the remaining dressing. Bienvenida primavera! I’m so very pleased to see you again. The days of lazy long lunches al fresco have returned. 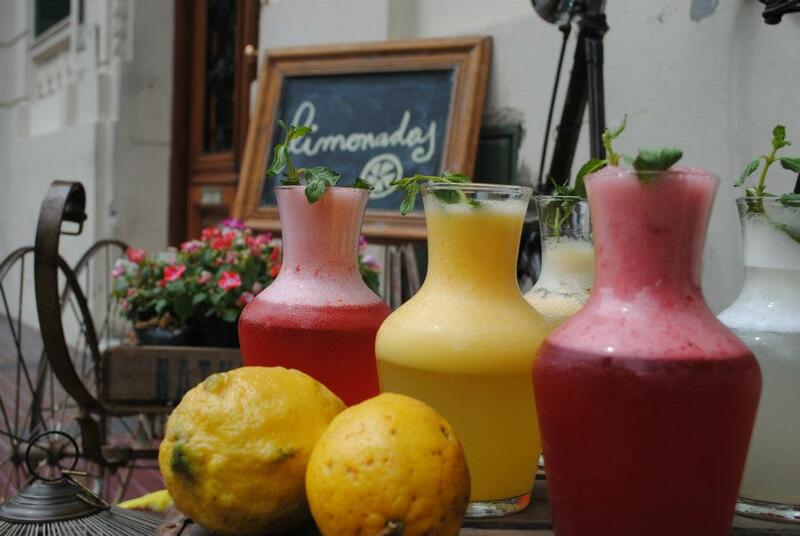 Freshly squeezed limonadas – photo from Hierbabuena’s Facebook page. One of my favorite spots to do just that is Hierbabuena. The place is adorable, the food is divine, and the wait staff is friendly. I’m always impressed with the quality of their menu; everything is so natural and fresh, and the flavor combinations are spot-on. I usually fall for the Menú del Día, although my other top favorite is the Brie Salad: warm brie over beet carpaccio with a date and nut vinaigrette. Believe it or not, I’ve yet to try the brunch they’re so well-known for, mostly because I prefer my brunch savory and there are so many other options calling to me. I highly recommend a jug of one of their juices, or a smoothie. You’ll feel energized immediately. 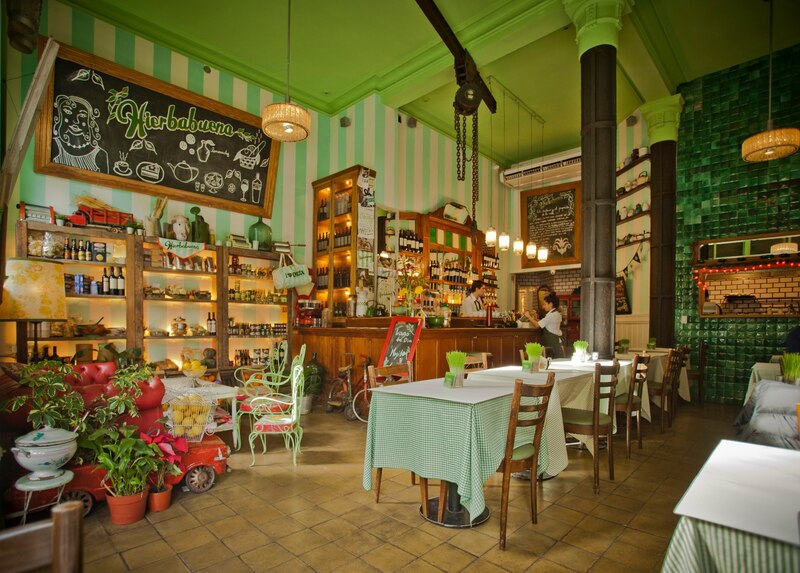 Photo of the charming interior from Hierbabuena’s Facebook page. This gorgeous day, we considered our lunch options over a chilled bottle of Cafayate Torrontés. I went for the Menú del Día: shrimp kebabs with grilled brie, braised pears and a mandarin reduction. Gaspar got his favorite, the Avocado Sandwich. 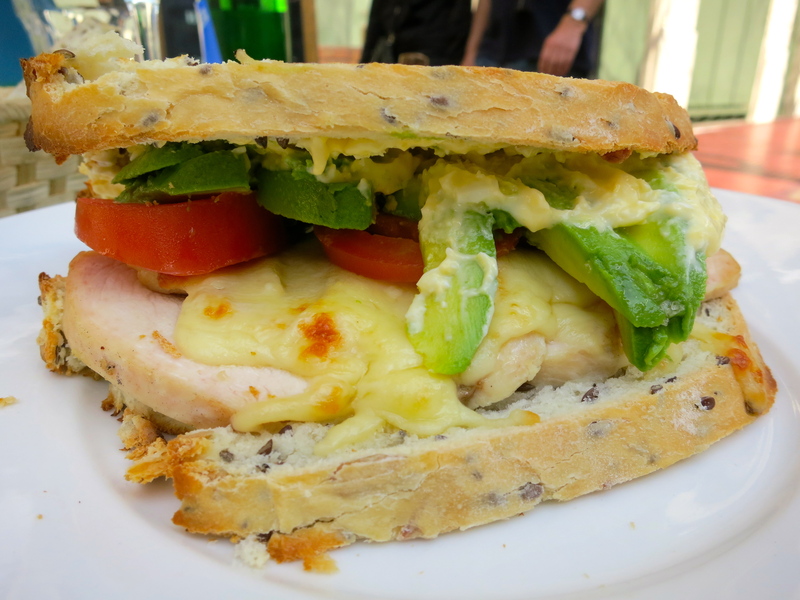 A chicken breast smothered in avocado, melted cheese, tomato, egg and mayo. So consistently excellent. This spot is what spring in the city’s all about. For a long time, the idea of making my own granola just never occurred to me. It was always so readily available, in every imaginable variety. And with all the health nuts constantly reminding me that granola’s not as good for you as you think it is, I tried to eat it sparingly. Then I read an article in Bon Appétit and the recipe sounded so delicious (and yes, healthy), I had to give it a try. It’s now one of my breakfast staples. I’m especially happy to have this recipe here in Buenos Aires, where there are not entire football field-length grocery store aisles dedicated to cereal. The lack of overwhelming and unnecessary selection is certainly not a bad thing, but see, I’ve got this thing about cereal texture….okay, yes, I’m picky. One of the great things about this recipe is its flexibility. You can add different nuts, fruits, or even dark chocolate pieces, based on your preferences. This version is modified from Bon Appétit’s original. I like to enjoy the finished product with yogurt and fresh fruit. Preheat oven to 300°F. Line rimmed baking sheet with parchment paper. Mix first 7 ingredients in a large bowl. Stir honey and oil in saucepan over medium-low heat until smooth. Pour honey mixture over oat mixture and toss. Spread on prepared sheet. Bake until golden, stirring every 10 minutes, for about 40 minutes. Place sheet on a wire rack, stir granola, and allow to cool before mixing in dried fruit. Store in an airtight container. This recipe yields about 5 cups.